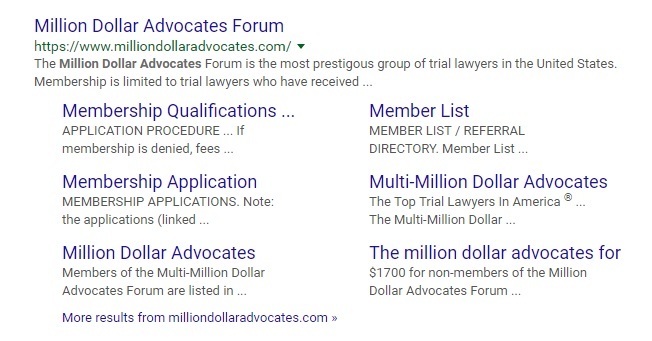 The Million Dollar Advocates Forum is a website with members who are personal injury lawyers and trial attorneys who have won million dollar or multi-million dollar verdicts. I have several clients who are members of the Million Dollar Advocates Forum, and I end up on the site often. Today I covered a problem webmasters worldwide are having, which is HTTPS versions of their HTTP sites displaying in Google search results. This is inadvertently happening all over the web, sometimes for different reasons. In this particular case, it appears the Million Dollar Advocates Forum does indeed have an HTTPS version of their website configured. However, I’m not sure why they have an HTTPS version set up. Maybe they are just testing it and not ready to implement it yet. When Google finds HTTPS sites though, they index them. Google announced this in 2015. Even if webmasters aren’t ready, bam, they show up in search results. Screenshot of HTTPS page indexed in Google search results. 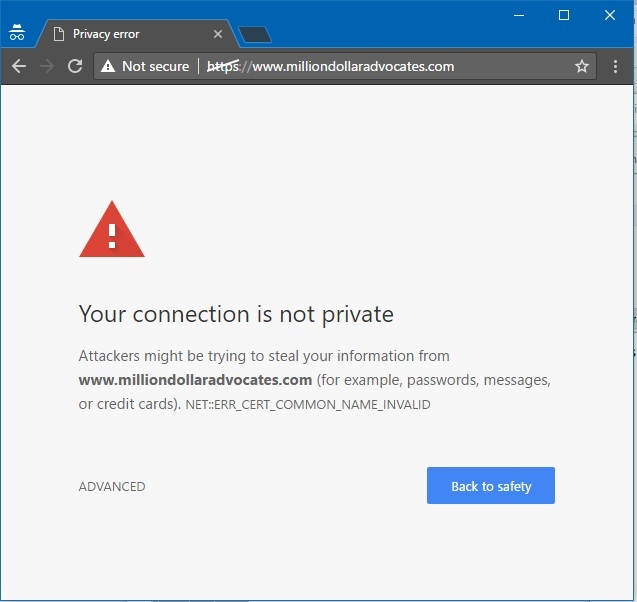 There is nothing technically wrong with the other than the fact that it is missing a correctly configured SSL certificate. Currently, when you visit the HTTPS version of the website, the SSL certificate which displays is for Verio. Verio is the web hosting company of The Million Dollar Advocates. Sometimes SSL certificates for other websites display on your site when you have no SSL certificate. This occurs often on Apache servers which use a vhost file. This is a little over my head here but I believe what is shown on an HTTPS site with no SSL cert is the SSL site at the top of the Apache vhost file, and in this case, Verio.com must be at the top of this file. Regardless, Million Dollar Advocates simply needs an SSL cert to remedy the issue or an HTTPS to HTTP redirect. Although redirects like that are complicated and if not done properly people will see an error. Again. If not fixed soon, Google will keep indexing their home page as a blank page with no content. When you are testing an HTTPS site, Google can find it. If they do, they will add it to their index in place of your HTTP site if you are ready or not. When that occurs, people attempting to visit your site will see a security warning and run. Screenshot. Web visitors are greeted with a message about people attacking their computer. Not good. The HTTPS side of things may have been there forever. Google has been aggressively discovering HTTPS versions of sites this month. I checked in on this today and the issue has been fixed. A few people tweet out my articles and I am guessing that the story was picked up by them there. In this case they stuck with HTTP.